On occasion on these pages, I have written about higher education and about labor rights, mostly in the context of the abysmal state of affairs when it comes to the political climate here in Michigan. I write from the perspective of university professor, president of our faculty union, and engaged citizen. And usually I write about things that happen to other people. But today, I have a story to tell about something that happened at my university, something that helped to clarify some things for me in a new way, about cultural problems on my campus and in our society more widely. This story is about how the administration of my university called the campus police on a bunch of professors as if they believed we might riot and how the campus police behaved when they responded to that call. 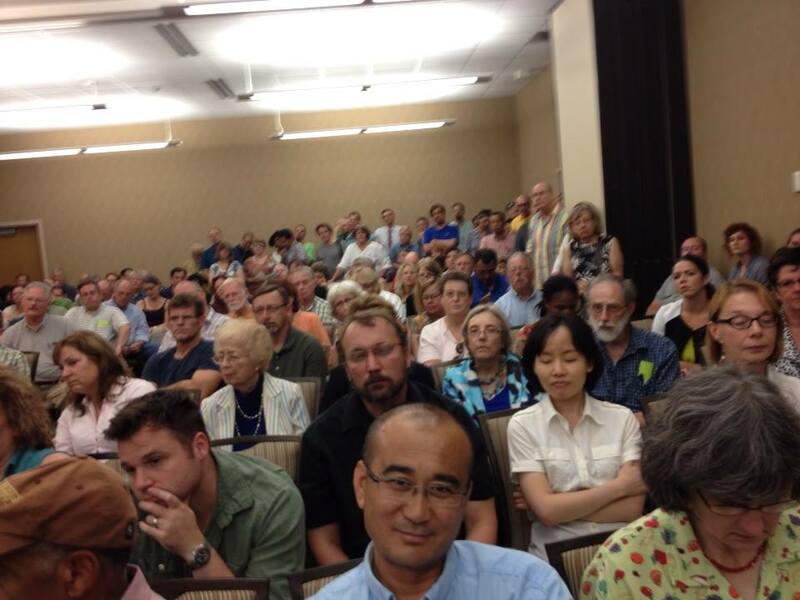 On the other hand, our chapter of the AAUP has over 800 members, many of whom followed the negotiation process closely. As chapter president, part of my job has been to remind my colleagues that our strength is in our numbers. Since we kicked off our contract campaign last fall, I have worked with the other chapter leaders, including our officers, our 12 executive committee members, and our 57 departmental reps, to make the case to our colleagues that the success of our team at the table would depend in large part on the active, vocal, and visible support of the faculty. 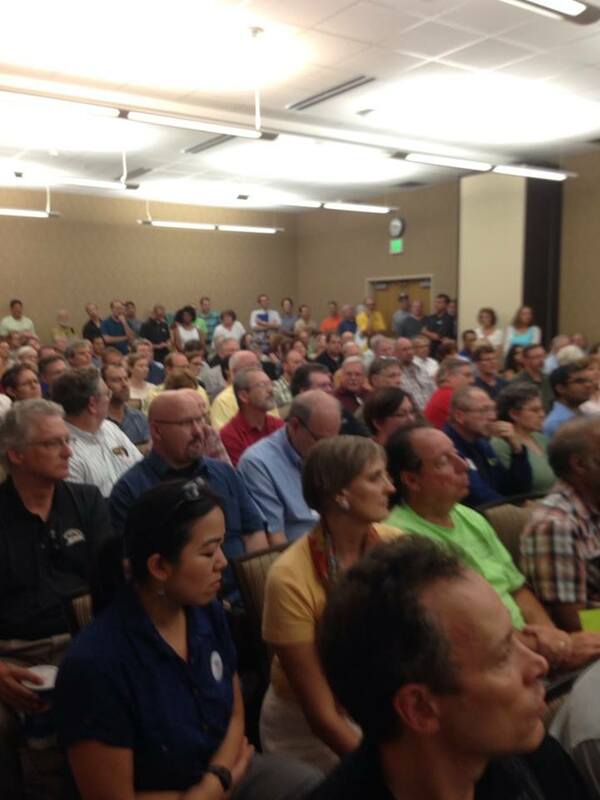 To that end, we sponsored a series of events beginning in the fall of 2013 through the summer of 2014. 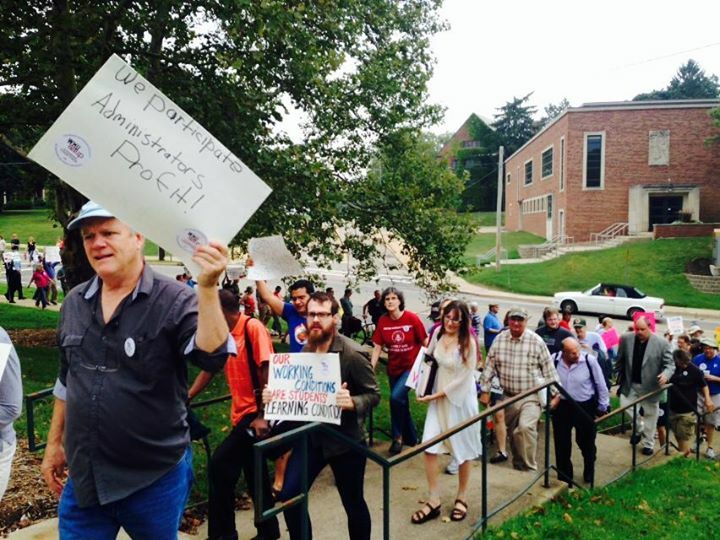 We had decent turnout for all these events, although our local media outlets seem to make a point of ignoring most of what we say or do, and it was clear that momentum had been building steadily since last fall as more and more of our faculty colleagues came forward to stand with our bargaining team. At the end of August, as the contract expiration loomed, the situation became more urgent, as it will when the contract expiration date is nigh. The administration increased its pressure on our team, and things occasionally got fairly tense at the table. But our team refused to knuckle under and remained firm in their resolve. There was talk around campus of a possible impasse and speculation about whether the contract would expire before we reached a tentative agreement. On August 28, the week before classes started, a time when many of our colleagues were not yet back on campus for the new academic year (a lot of people don’t realize that most professors don’t actually get paid in the summer), 150 faculty members rallied in front of the administration building, along with students, alumni, and retired colleagues. Our signs and chants expressed our concerns about the priorities of the university’s senior administrators, whose financing decisions in recent years suggest a declining interest in providing robust support for the instruction and research that are our raison d’être and a growing interest in investment in athletics, swanky (and expensive) new residence halls, and administrative hiring, bonuses, and perks. 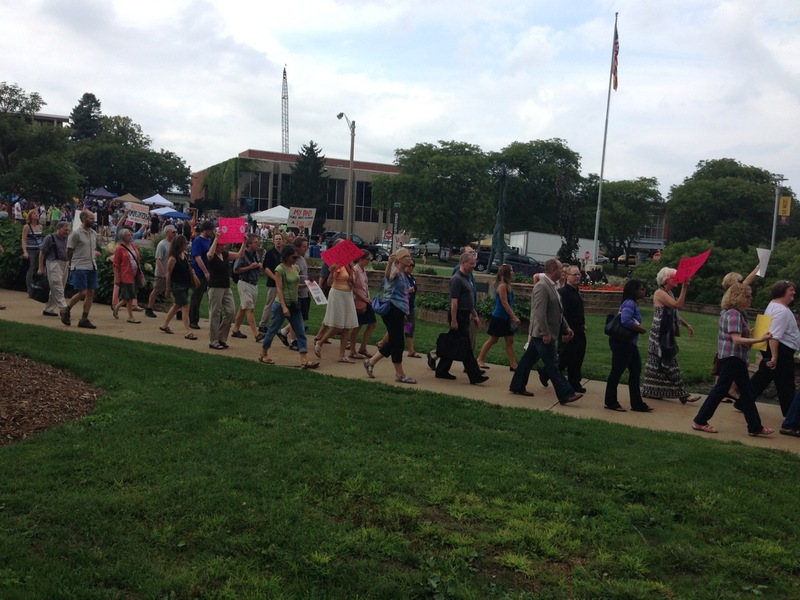 The rally on August 28 was not covered by any of our local media. And at the bargaining table later that day, the administration’s team members pretended not to know anything about it, although this was clearly disingenuous on their part. And just as clearly, they were not happy about it. Progress continued to be made at the table in fits and starts in bargaining sessions on the 28th and on Friday the 29th, but things were also getting heated and occasionally even ugly. Because time was running out on the contract, the two teams agreed to meet for a special Labor Day session on Monday, September 1. 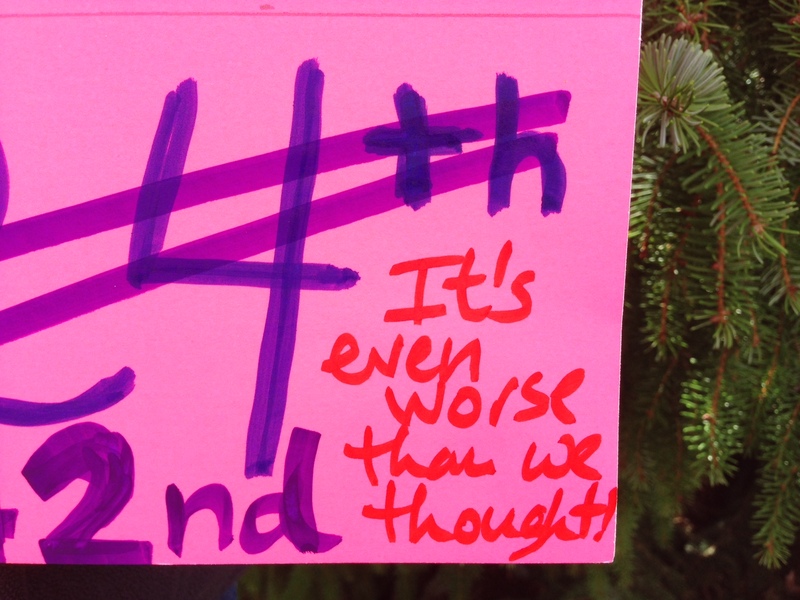 It was of course a no-brainer for us to organize a Labor Day rally. Meanwhile, the administration continued to send out negotiation updates from their perspective to an unknown group of recipients they addressed as “Campus Colleagues” (and yes, they capitalized “Campus” and “Colleagues” for some reason that also remains unknown to us). They disseminated this information via their exclusive access to campus-wide email lists, e-newsletters delivered to all employees of the university, and other official university communication media. The administration may be eager to take advantage of its access to university resources and to use them to try to frame the issues according to their own interests, simply because that possibility is available to them. However, because Western Michigan University is an institution of higher learning, we are all held to a higher standard. All of us who are engaged in this enterprise are obliged to promote and model the practices and values that are fundamental to our common mission. These include collaboration, the promotion of free inquiry, and the advancement of human knowledge and understanding. As tempting as access to official university mouthpieces and publications might be for the administration, using those media to present a one-sided view of the negotiation process, and especially without identifying it as such, conflicts with the values and principles we are all obliged to uphold. By deliberately representing as fact that which is very much a subjective point of view, as well as by excluding alternative viewpoints, the core academic values we all share in common are subverted. After I sent this message, I posted it on the chapter blog, linked it to our Facebook page and Twitter account, and headed over to Montague House, our union headquarters, for our Labor Day rally. Over 130 colleagues also showed up, and after walking our team across the street to the building where their sessions were held, the rest of us stayed outside for another 20 or 25 minutes or so, chanting and displaying our signs to the administrators inside the bargaining room, which is conveniently located on the ground floor and features nice big windows. That is my emphasis added. (For now I will ignore the part about why it might matter to her if there were a lot of faculty in attendance from what is by far the largest college on campus.) Of course, from where she was sitting inside the conference room, she could not possibly have seen everyone, which could explain why her count was off by almost 100 people. And I realize that of course she was attempting to put a brave face on an event that by all accounts made the administrative team uncomfortable. Still, her email suggested to me that our message was still not getting across. The administration did not seem to hear us when we showed up first on August 28 or when we came out again on September 1, on Labor Day, to say that the faculty is behind its team, that a university that brags about its “top 100 national university” designation is hypocritical when its faculty salaries rank “far below median,” according to the Chronicle of Higher Education, and that we were not going to tolerate moving any further behind in our next contract, especially while our university president is pulling down a cool $776,000 in salary and bonuses. He is now the 18th-highest paid public university president in the country, while his faculty languish in 342nd place, and he doesn’t seem to have the good grace even to pretend to be embarrassed about that appalling discrepancy. 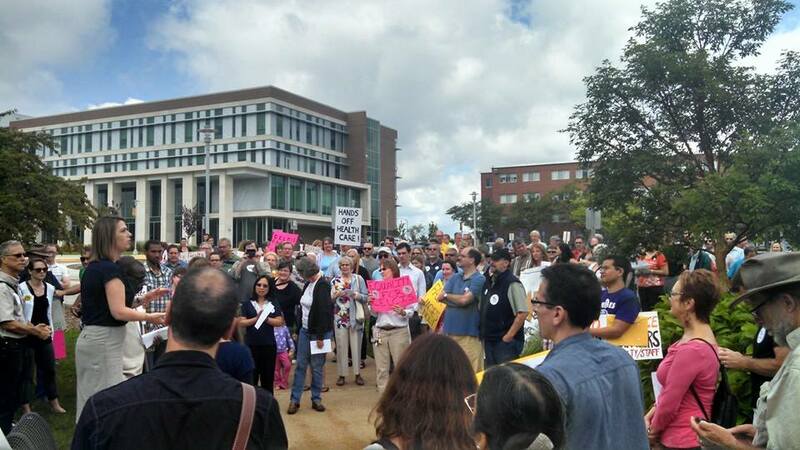 Faculty rally at WMU on September 1, 2014. Meanwhile, faculty concerns about the dearth of tenure-track hires are routinely brushed off and contradicted, but the numbers don’t lie. Part-time faculty are increasingly used to cover faculty vacancies, at working-poor salaries any college president making three quarters of a mil ought to be ashamed of. Senior colleagues delay retirement because they know they won’t be replaced and worry that academic programs they have spent decades building will simply disappear when they are gone. Massive, multi-year administrative pet projects bury all of us in extra work on endless committees, task forces, “project management teams,” and “tactical action communities,” all of these in addition to our already full workloads. Legitimate faculty grievances are routinely denied, often with little more than “Because we say so” as an explanation. Every faculty mistake, large or small, real or imagined, is treated like a capital crime, yet no administrator is held accountable even for the most egregious violations of the contract or unprofessional behavior. Faculty members are treated with barely disguised (or undisguised) contempt by some of our senior administrators. A colleague with 40 years of service to the university recently told me he can’t remember ever feeling so disrespected by the administration. All the while, we fall farther and farther behind not only our peer institutions but even those institutions for whom our university is aspirational. Anyway, with our contract scheduled to expire at a minute after midnight on Friday, September 5, we scheduled a chapter meeting for Friday afternoon so that the faculty could come together to talk about where we were, what they wanted us to do, and what they were willing to do to support our team. “Depending on what happens in the next few days,” I wrote to my faculty colleagues in an email inviting them to the chapter meeting, “we may need also to make our feelings known in a more public way immediately following the chapter meeting, so please be prepared for that possibility on Friday afternoon. We had a wonderful chapter meeting on September 5, with a huge turnout that filled to capacity (and probably beyond capacity) our large meeting room in the student center. Building staffers wheeled in stack after stack of additional chairs. Every new seat was immediately filled. And probably a hundred or more faculty colleagues remained standing throughout the meeting simply because there was nowhere left to sit. There may have been a violation of a fire code or two. The discussion was lively, spirited, intense, and upbeat. True to our usual character as a university faculty, we were not all in agreement on everything. But the consensus on the big-picture issues and challenges facing us quickly emerged: We could not go backwards in the new contract – we would not. Colleagues from departments and colleges all over campus spoke up. Their words were wise, thoughtful, and passionate. We applauded and cheered and felt empowered by the words that were spoken, by the friends and colleagues who had spoken them, and by the resulting positive energy and power in the room. With the contract set to expire in about nine hours, I asked my colleagues if they were ready to march with me in support of our team, if they would march through a major event that happened to be getting underway on campus right about that time, and if they would continue to the administration building. “Only this time,” I added, “why don’t we go inside? This is our university, too. We shouldn’t always have to stay outside.” After a few more minutes of discussion, a colleague stood up to say he thought it was time we headed out to begin our demonstration. The room erupted in cheers. I closed the meeting by saying to my colleagues: “Your negotiation team has heard you. Your chapter leadership has heard you. Now it’s time for the administration to hear you!” And with that, we grabbed our signs and our solidarity banner, and we went outside. The event they call Bronco Bash is a huge welcome-back party for the campus community that is said to attract about 20,000 people each year, mostly WMU students. It includes live music, activities, and booths where student organizations do their things and local businesses do theirs, and it’s just a big, loud, fun party to celebrate the new school year. It happens every year on the campus of Western Michigan University, on the Friday at the end of the first week of classes. This year, that happened to be September 5. It is hard to describe the feeling as we walked through the plaza and saw and heard our students cheering us on and raising their hands in the air as we went by. Some of them joined us to march for a while, others cheered as we passed by, and occasionally a student would call out to an individual faculty member (“Go, Dr. Al!”). All in all, the students we encountered were tremendously supportive and absolutely wonderful. But then, that is who they are all the time and why professors do what we do. After we made our loop through Bronco Bash, we circled around toward the administration building. We queued up on the wide walkway out front as the rest of our party caught up. 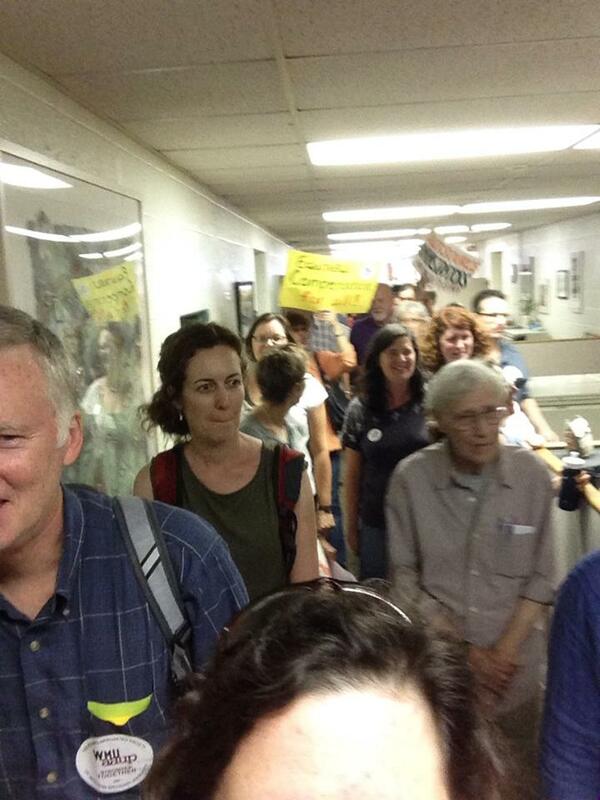 It was a long, long, line of professors out there, and it took a few minutes for us all to reconvene. At that point, we decided to follow through with our original plan and go inside. 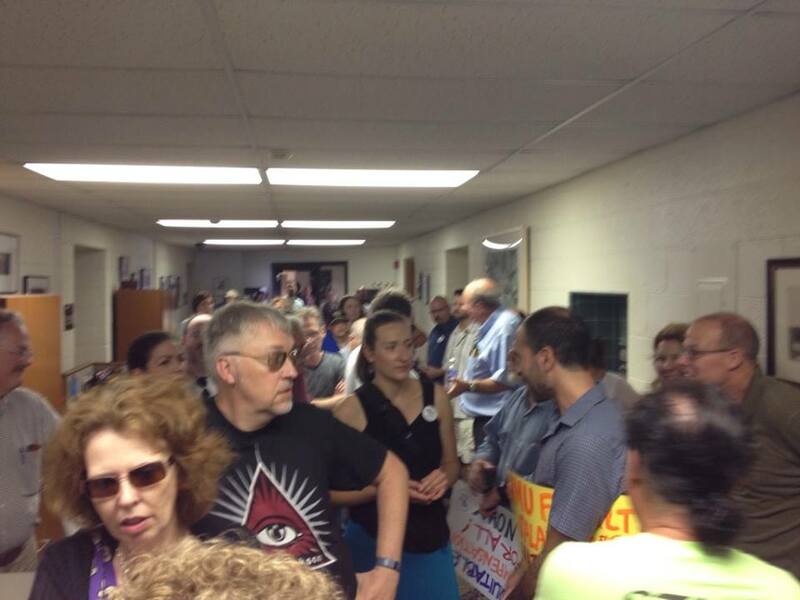 The faculty continued to chant loudly as they approached the doors to the building, but polite professors that they are, everyone kind of just automatically took it down a couple of notches as we entered the building. The student receptionist at the front desk looked up, a bit startled, as the first among us walked in, but then she immediately smiled and said hello. We returned the greeting and moved into the stairwell to go up to the next floor to the senior administrative office suite. Another student greeted us when we got there and began to enter through the glass doors leading to the suite. But immediately after that, a senior administrator came storming down the corridor toward us, looking furious and not speaking to or making eye contact with any of us, even though many of us were of course known to him (including me, and I was at the front of the crowd and would have been hard to miss). He began gesturing to the student workers and members of the office staff who were present, although it appeared to be something of a skeleton crew, which was not surprising given that it was Friday afternoon and there was a big, loud party with 20,000 attendees going on right outside. One young staff member was holding out his iPhone toward us, although it wasn’t clear whether he was attempting to photograph us with it or whether someone was on the phone wanting to know what in tarnation was going on. There was a bit of scurrying about and then some slamming of doors, as most of the staff on the scene disappeared into a conference room. 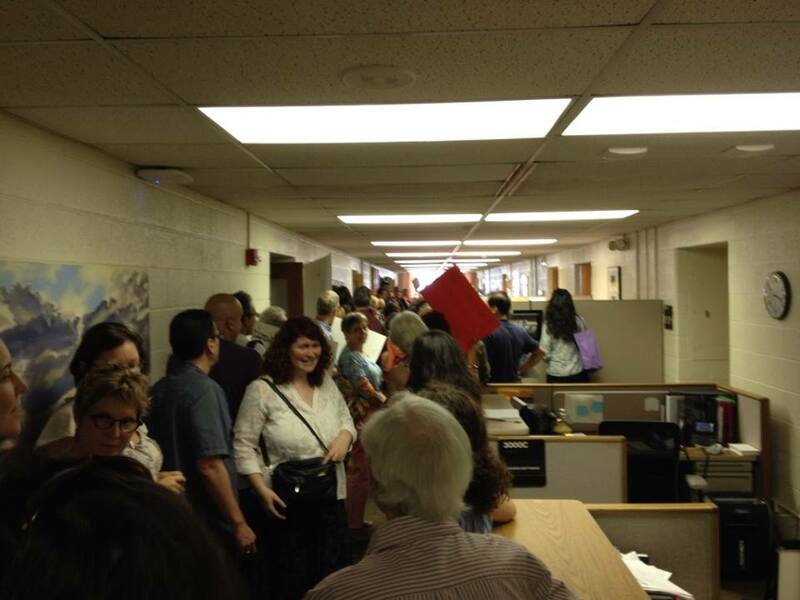 Faculty continued to file in, probably over 200 of us, and we filled the outer office area of the administrative suite. We did not enter any private offices or cubicles. We did not touch anything, break anything, or stand or sit on anything. We stayed in the public area and continued to chant for another maybe 10 minutes. The president did not seem to be around, nor did any other administrator, apart from the angry one who had met us upon arrival but who had since disappeared, probably into the conference room he seemed to be ordering everyone into. The president’s receptionist and executive assistant were in their offices, however, and they will both always hold a special place in my heart because neither of these two lovely women closed their doors to us for as long as we were there. I won’t claim they were thrilled to see us (or to hear us), because they probably could have done quite nicely without our visit, but at no point did they treat us as though we didn’t belong there or behave as though they believed they were in danger, and we appreciate that. I had just screwed the top of my bottle back on when the campus police arrived on the scene. I want to stress that the behavior of most of the police officers was professional and respectful as they carried out the task of removing us from this building on our university campus at what was already pretty much the end of our demonstration. Unfortunately, several other officers behaved aggressively and disrespectfully, storming into the administrative suite and ordering us to leave immediately. They appeared angry and emotionally charged from the moment they arrived on the scene, treating us with considerable hostility and threatening us with arrest if we did not get out. With raised voices, they ordered us to leave immediately and yelled at us that we were disrupting the business of the university. When a faculty member asked one of them what law we were breaking, he was informed that he would be taken to jail if he didn’t get out immediately. Even more unfortunately, the worst behavior was that of the chief of campus police. He was not in uniform and did not identify himself to us when he arrived on the scene. He simply yelled and threatened and acted like a bully. That was the example he set for his officers. And because he was not in uniform, we had no idea who he was or what right he thought he had to order faculty members out of a building on our university campus. Several other officers unfortunately followed his example and raised their voices to us and otherwise acted like bullies as they circulated among us ordered us out. When they told us to leave, we complied. No one resisted. Everyone moved in an orderly fashion toward the exit. I mean, we’re professors. We’re pretty non-threatening. But there were probably still over 200 of us, so it took a few minutes for everyone to get out the door and down the stairwell. But everyone complied. I stopped then and turned toward the colleague who had spoken. She was barely five feet tall (and, I found out later, 67 years old) and she was glaring at the big, angry guy who had been behind her, who was not in uniform. He responded by ordering her to get out. His tone and posture were hostile and aggressive. He was at least a foot taller than she was and probably had nearly a hundred pounds on her. She told him to keep his hands off her and demanded his name. I wish I could remember the exact words of his response, because he did not deny having put his hands on her and essentially said that he would do it again and arrest her if she didn’t get out. She continued to insist that he tell her his name and informed him that she would be filing charges against him. He said he was the chief of police. She replied, “I didn’t ask your job title. I asked you for your name.” He finally told her his name and then threatened her again with arrest if we didn’t get out. She and I turned to go, and I ended up walking next to one of the other officers on the steps going down. “What exactly were we doing that is illegal?” I asked the officer, whom I had seen around campus many times before and who is not at all a jerk and did not behave like one that day. “It was disruptive,” she replied. “What we were doing is constitutionally protected,” I said. “We were exercising our rights to free speech and peaceable assembly.” She gave me a look like she got that, but all she said was, “It was disruptive.” I thanked her for maintaining a calm and professional demeanor and went outside. Once we were all outside, the word came around that the president of the university would be arriving at 4 p.m. for a scheduled meet-and-greet and photo op with students as part of the Bronco Bash activities. It was about 3:20. I decided that even if no one else wanted to hang around for that long in the blazing heat, I needed to stay to tell him what had just happened: that a loud but clearly peaceful protest by a bunch of professors with a median age of about 57 and a combined length of service to this university of about 3,000 years had been met with a ridiculous overreaction on the part of the ranking administrator on the scene (who seemed to be drawing on training for what to do in an active-shooter situation) and an even more ridiculous overreaction on the part of the campus police, including an incident in which a big, angry chief of police shoved a petite 67-year-old professor from the College of Education. But it turned out that almost everyone else also wanted to stay. So we decided to wait for the president in front of the administration building. However, we were immediately ordered off the sidewalk and onto the grass by some of the officers, several of whom then staked themselves out around our (still pretty large) group, photographing us and recording video as we hung out, looked for shade, and waited for the president to show up. I’m sure their footage is very exciting. The rest of the officers positioned themselves in front of the entrance to the building, as if anyone in their right mind could have possibly believed we might be thinking about trying to storm it. The president showed up at 4:00, as promised, and he staked out his position under his photo-op tent. I was standing with the colleague who had been pushed by the police chief, and I told her that I thought he needed to know what had just happened, meaning the general overreaction and hostility with which we had all been treated but also what had specifically happened to her. She agreed and said that she wanted to tell him that part herself. 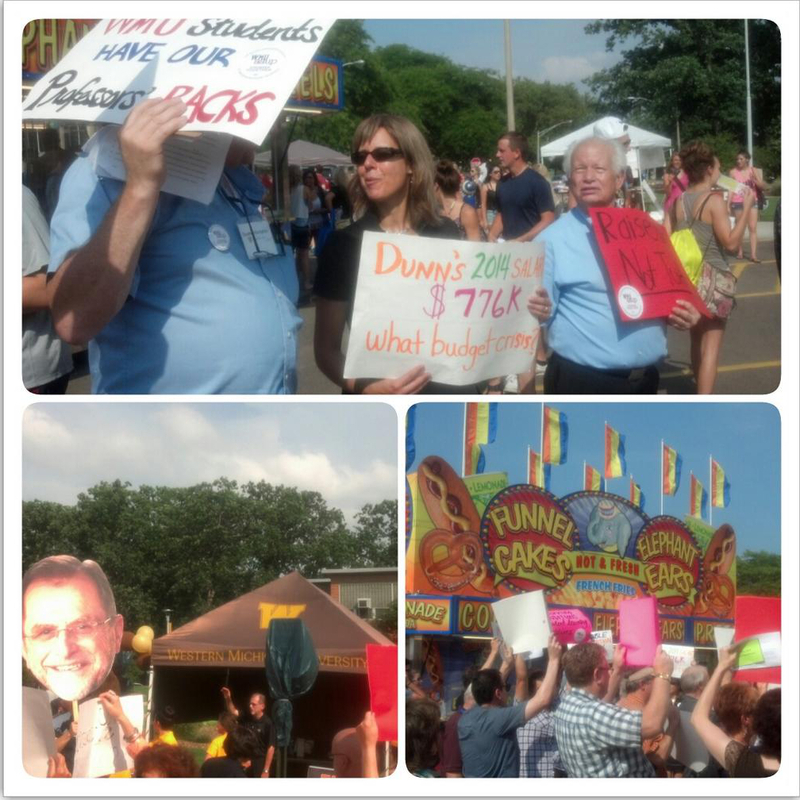 We walked together over to the tent and got in line to wait our turn, still carrying our signs from the demonstration. When it was her turn, I stepped out of the line and off to the side to join other colleagues who were still holding up their signs and talking with students. As I was walking away, I could hear the president, who had his arm around her for the photo, say to her that he was sorry about what had happened to her. Meanwhile, the negotiation teams had gone back to the table at 3:30. The rest of us talked about gathering outside the bargaining room at 6 p.m. and making an evening of it, hanging out, ordering pizza, and supporting our team. But the weather did not cooperate with that plan, and severe storms began blowing through town at about 5:45. A bunch of us decided to hang out at the union HQ, where we ordered pizza, planned our long game, and exchanged texts with members of our team during their caucuses. Unbeknownst to all of us, trees and powerlines were down all over town from the storms and power was out for thousands of local residents. I sent everyone home at 11:15. What happened between 11:15 and midnight was dramatic and tense and exciting and and infuriating and awesome and all kinds of other things, but I am already committed to one long story here, so in order to avoid getting into another, I will just say that the teams reached a tentative agreement by midnight, when our old contract expired, and that it was a much better contract than I believe we would have gotten had the faculty not made its feelings known so clearly and unequivocally earlier in the day. This has been a very long story, I realize, and maybe some of you are hoping that there will be teargas or at least pepper spray at the end of it. There isn’t. There wasn’t. (Not for us, anyway.) Rather, this is just a story about over-the-top hostility toward the faculty of my university by its administration and by the police force they deployed on their behalf. Understand that in no way do I delude myself by thinking that this incident compares in any way to the devastating violence and dehumanizing treatment that police behaving inappropriately have unfortunately visited on far too many of our citizens in this country. It does not. But still, it suggests some disturbing things. 1. If the highest-ranking member of the campus police at my university, along with his subordinates, go directly into jackbooted-bully mode to respond to a peaceful (if loud) faculty demonstration, where the participants are mostly white, mostly middle aged, and all professors who are well known on campus and in this community, it troubles me deeply to imagine how our students are treated in incidents that involve interactions with these same police. For what I think must be obvious reasons, I am especially fearful for our young male students of color. 2. In my privileged experience as an educated white woman, for most of my life I have had no firsthand knowledge of something many of my fellow citizens have long known all too well, and that is how the demeanor and behavior of police can escalate a situation if they mishandle it by confronting citizens with anger, hostility, and intimidation. The campus police arrived on the scene of a peaceful protest that was already winding down before they got there, but by the time their work was done, a lot of my professorial-type colleagues were pretty righteously pissed off. The behavior of the officers not only did absolutely nothing to defuse the situation, but it went a long way toward making many of us very, very angry. If we had been anything but completely nonthreatening and nonconfrontational, which is what we were (and you can see for yourself in the video of the demonstration linked here), I can’t imagine what might have happened. 3. The officer who identified himself as the chief of police failed to remain calm or conduct himself professionally in his interaction with the faculty of the university that employs all of us. In addition to his unprofessional and inappropriate interaction with the colleague whom he allegedly pushed, his overall demeanor toward all of us was hostile and disrespectful from the moment he arrived. His emotionally charged response was completely inappropriate and unprofessional, and several of the officers under his command unfortunately followed his example. Once again, if this was his response to a peaceful protest involving a bunch of middle-aged professors, I can only imagine what might happen when he is called to respond to a situation involving our students. Over the past two weeks, colleagues have been sharing photos that they took that day, and in every one the police chief appears in, his body language and facial expressions are aggressive and angry. (Some of these pictures are included in the diary. You can see more pictures here.) His demeanor on Friday and the way he treated and spoke to us should raise serious questions about his fitness for such an important position at our university. I hope the senior university leadership is exploring these questions and taking them seriously. If they are not, the faculty and the campus community deserve an explanation as to why they are not. However, I am not optimistic. 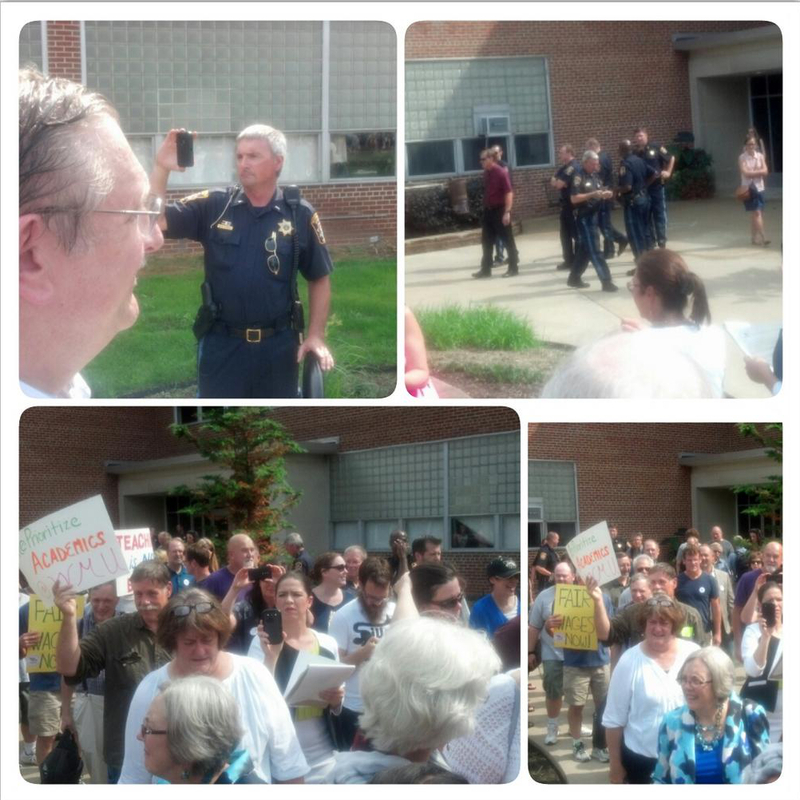 A colleague texted me on Thursday from where she was having lunch at the student center to say that she had just overheard a campus police officer tell an administrative staffer that the faculty union “entrapped” the campus police at the protest. The staffer replied that she thought “those images of the police were obviously Photoshopped.” Such is the culture of denial on my campus. 4. Was the approach the chief used with us on September 5 condoned by the university’s senior administration? We don’t know. The student newspaper covered the incident but no administrators are quoted in their story, which is so far the only coverage the incident has received. The faculty member who was pushed has filed her complaint about the officer, and so now the administration is probably circling its legal wagons and clamming up. Until and unless the administration says or does something (convincing) to the contrary, the overreaction to our peaceful protest unfortunately suggests some disturbing things about how faculty are viewed by the administration (and apparently also by the campus police), about our campus culture, and about the university’s overall leadership style. Their actions – administration and campus police – should raise serious questions with the university’s board of trustees and in the community about what is going on with the university’s leadership and with the increasingly toxic culture at WMU for faculty, staff, and most importantly, for our students. (Sadly, it probably won’t. There are a lot of heads stuck in a lot of sand round these parts. And as I’ve mentioned, there is no local media to pressure the administration to come clean and do any real soul-searching. 5. As we’ve seen in the news lately, campus police around the country are now being provided with military weapons, including M-16s and grenade launchers, by the Department of Defense. Can I just say what a breathtakingly stupid and dangerous idea that is? I have a few additional thoughts, but I think this is already way longer than anyone’s got the patience to read all the way through, so I’m going to stop where I am and just leave it where it is. Posted in Higher Education, Michigan, My Day Job, Professors: We're Rich and Lazy!, Union-busting, Unions. It really happened. And in Michigan, of all places. On December 6, 2012, Republicans in the Michigan state legislature rammed through two so-called “right to work” (RTW) bills during a lame-duck session with the potential (and, arguably, the intent) to decimate organized labor in a state whose prosperity through the better part of the 20th century was built on unionism, a tradition that was hard fought and bravely won. On December 11, 2012, GOP Governor Rick Snyder signed these bills into law. Because the lame-duck GOP could not muster the two-thirds majority required for the acts to take effect immediately, there was a constitutionally mandated waiting period of 90 days from the end of the session at which the measure was enacted. That 90 days is up today, March 28, 2013, a date that is sure to go down as one of the darkest for people in Michigan who have to work for a living, which is of course the overwhelming majority of us. It is also likely to have repercussions for working people nationwide. I am writing this post as a citizen. I also happen to be the vice president of the faculty union at the university where I am employed as a professor of linguistics. In my capacity as VP of our chapter of the American Association of University Professors, I write a blog about labor issues of interest to my faculty colleagues, and at some point in the near future, I will write a post to address some of the issues I am getting into here. But right now, I want to write simply in my capacity as a pissed-off citizen of a once-great state with a once-thriving middle class where upward mobility was for a long time during the last century a real possibility for regular people who weren’t born rich and who have to work for a living. It was indeed, in all kinds of ways. Police, who along with firefighters are exempted from RTW initially claimed that the building was over capacity but later changed their story to claim that there were safety concerns over fears that the crowd would become “unruly.” Peaceful protestors – also known as citizens and taxpayers — were arrested and maced during demonstrations that drew thousands on December 6, the day the legislature took up the bills. I thought it would seem obvious to any thinking person that when people living off the fat of the state payroll abuse their positions in ways that threaten people’s livelihoods and economic well-being, said people are likely to get pretty righteously pissed off. As egregious and anti-democratic as this whole fiasco was, what is even worse is that the sponsors of the bills made sure to include an appropriations provision in order to make them referendum-proof and therefore repeal-proof. Lame-duck session. No public hearings. No chance for referendum. Republicans, who are ushering right to work through the Legislature during the lame-duck session, said the appropriation is nothing unusual.Democrats and union leaders say it’s a political tactic aimed at minimizing dissent on the controversial legislation. That’s right: A million dollars in each bill. Two million dollars for “administrative costs associated with implementing and enforcing right to work and educating the public about the labor law.” That’s two million dollars of the taxpayers’ money to spend on promoting highly unpopular legislation signed into law by an increasingly unpopular governor. Two million dollars that won’t be going to improve Michigan’s badly deteriorating infrastructures, or to bolster education, or to createjobs. Apparently, Michigan can afford to spend $2 million on “right-to-work” propaganda on behalf of the deep pockets who bought and paid for these bills in the first place by buying themselves a state legislature. Of course they can afford to pay for the propaganda themselves. It’s not like they haven’t done it before. But why should they, when they can mooch off the rest of us? 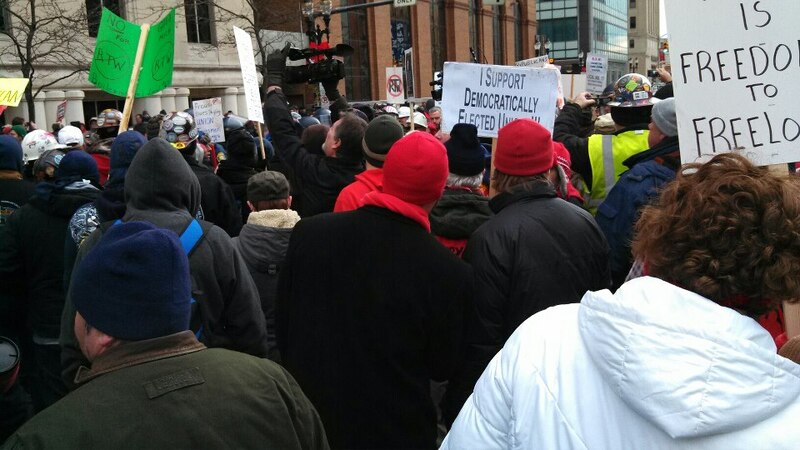 Thousands of protestors returned to Lansing on December 11, the day the governor was expected to sign the bills into law. 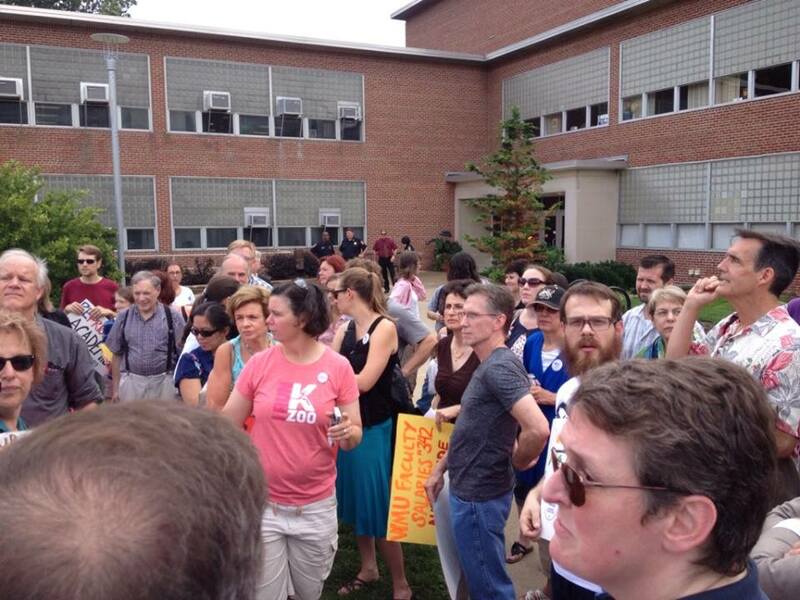 The crowd included a lot of faculty and staff from my university. We have long been a strong union campus with seven employee bargaining units in all, including local chapters of the American Association of University Professors, AFSCME, and two affiliates of the American Federation of Teachers representing part-time faculty and graduate teaching assistants. And alongside instructional staff were landscape workers, maintenance workers, technicians of all stripes, food-service workers, and custodial workers. We joined thousands of friends, colleagues, and neighbors. 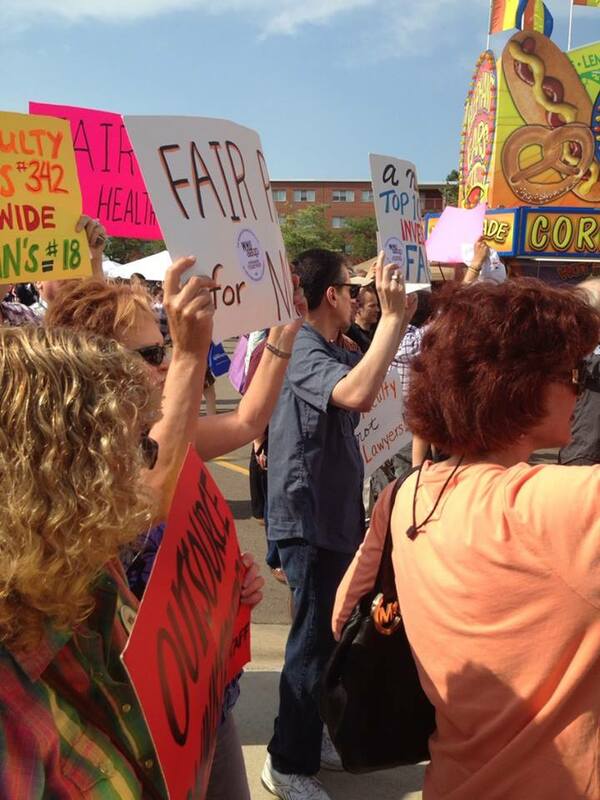 We marched alongside nurses, auto workers, K-12 teachers, electricians, construction workers. The UAW was there, and so were the Teamsters, the United Farm Workers, and the United Food and Commercial Workers, the Service Workers International, the Building and Trades Council, and many others. Thousands of us marched in Lansing on that frigid, windy December day. Thousands more phoned and emailed the governor to try to get him to listen to reason, to implore him not to sign the bills. Cops in riot gear seem to want us out of here. This is our house! 2:29 p.m. on December 11, 2012. Gov. hasn’t signed anything yet acc to Capitol staff. Call him now and tell him to veto the RTW bills! 3:01 p.m. on December 11, 2012. I don’t know where you were. They gassed and arrested a bunch of people outside the Romney building…totally unprovoked. I was right there. 4:52 p.m. on December 11, 2012. Damn him. He signed the bills. Damn him. 6:01 p.m. on December 11, 2012. Two years ago, a newly elected Rick Snyder told the Free Press editorial board he was determined to be a new kind of governor — a pragmatist focused like a laser on initiatives that promised to raise standards of living for all Michiganders.And until last week, we believed him. Watching Snyder explain his right-to-work reversal was disturbing on several levels. His insistence that the legislation was designed to promote the interests of unionized workers and “bring Michiganders together” was grotesquely disingenuous; even as he spoke, security personnel were locking down the capital in anticipation of protests by angry unionists. 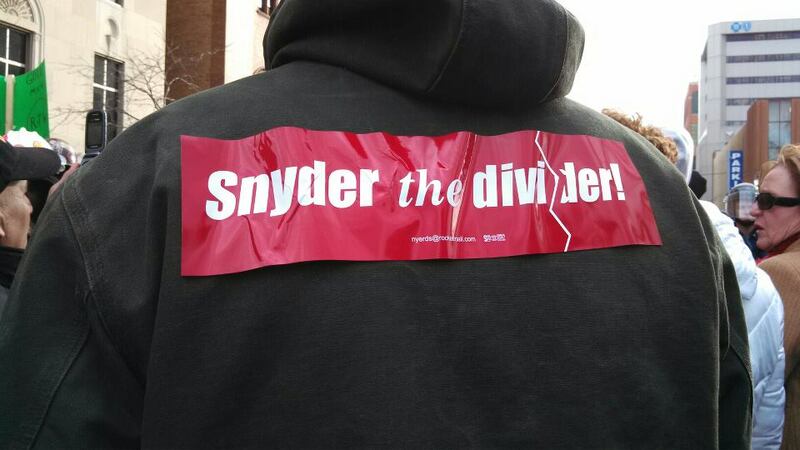 Snyder’s ostensible rationale for embracing right-to-work legislation — it was, he insisted, a matter of preserving workers’ freedom of association — was equally dishonest. The real motive of Michigan’s right-to-work champions, as former GOP legislator Bill Ballenger ruefully observed, is “pure greed” — the determination to emasculate, once and for all, the Democratic Party’s most reliable source of financial and organizational support. But that is less an excuse than a confession that Michigan’s governor has abdicated his leadership responsibilities to Republican legislators bent on vengeance. And now 90 days have passed, and RTW is now the law in Michigan. A lot of my colleagues are asking what RTW is going to mean for us. 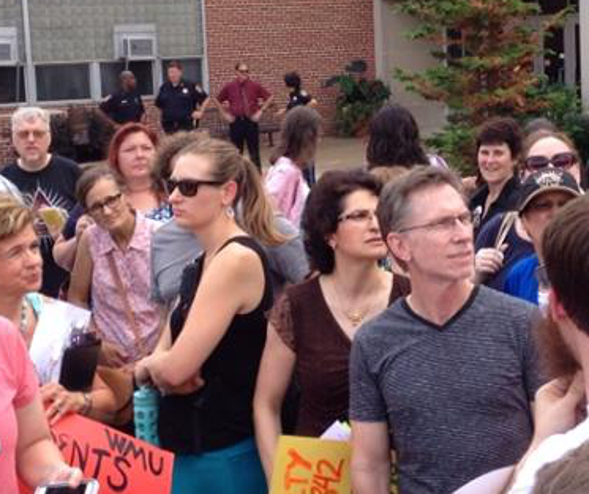 Our current contract expires on September 6, 2014, and on that day, the board-appointed faculty at Western Michigan University will after 38 years no longer have an agency shop. The other unions on our campus will lose their agency-shop status as their contracts expire over the next three years. I don’t have good answers to their questions yet. I don’t know that anyone does. Lawyers and labor experts have yet to figure out what all this is eventually going to mean for workers in Michigan and beyond. But the outlook isn’t good. In the meantime, lawsuits have been filed and the fight goes on. I am going to stop writing now, even though I still have not said what I came here to say, even though by now it was yesterday morning when I woke up in a “right-to-work” state. I came here to write about RTW in the specific context of the destructive legislative manipulation, interference, and flat-out blackmail now being visited upon public universities in this state. I came to write about the constitutional right of these universities to institutional autonomy, vested in our boards of trustees, and how the state constitution is being subverted by those who are sworn to uphold it. I came to write about the pettiness and the hypocrisy and the thoughtless and mean-spirited actions of people whose abuses of power threaten the economic survival of the people of this state. I came here to write about how 2014 starts now, and how we can’t let these bastards destroy everything that the people who came before us risked their lives for and what they won for all of us. I came here to write about how we have to stand up to these control-freak bullies and how we must stand up alongside the brave people who are fighting hard to do what’s right. I came here to write about how we need to get to work on doing everything we can to dismantle a corrupt system that has made it possible for ignorant, thoughtless assholes to run this magnificent state into the ground, all the while enjoying seats in the legislature that are safe until the sun goes supernova, in a state that is gerrymandered to within inches of its life, bankrolled by heartless assholes who don’t give a damn about anyone but themselves. I will come back and say all of those things and a lot more very soon. But tonight I am just too sad. Posted in "Right to Work", Higher Education, Koch Brothers, Michigan, People Who Piss Me Off, Union-busting, Unions. My worlds have been colliding in some interesting ways lately. Back in August of this year, I started writing this blog (which I began cross-posting at Daily Kos in September). I have always been interested in progressive issues and social justice, an orientation that very much informs how I make my way in the world and has led me to pursue the kind of career in which I believed (and still believe) it could be possible to make a real difference in people’s lives, preferably for the better. My day job is professor of linguistics, and my particular interests are in language variation and the history of the English language. (I write a linguistics blog on these topics called Functional Shift, although I’ve been a bit slack about keeping it up since I started writing Alevei.) Because language can be such a powerful force for good but can also be wielded in ways that can cause great harm, my approaches to research and teaching assume that linguistic justice is social justice. I will write more on that topic in a forthcoming post, because it has been on my mind even more than usual lately, but for now, I will just say that I consider all teaching and academic scholarship to be political acts in themselves, which is to say that I am aware that this is the case and acknowledge it, even though many who are engaged in academic work do not acknowledge it, and a lot of them probably don’t even realize that it is or would not admit it that it is. Of course, we are not all working from the same political orientations or toward the same ends. There is actually far more intellectual diversity in the profession than the popular stereotype of the “typical” academic as politically liberal would suggest. Anyway, this post isn’t really about the day-to-day work of professoring, although that is definitely relevant here in a couple of ways. I started this post by saying that my worlds have been colliding in recent weeks. The epicenter of that collision is my candidacy for the vice presidency of my faculty union in an election that is now underway and that thus coincides with the “real” election coming up this week. Here in Michigan, the “real” election will include several ballot initiatives, including Proposal 2, which would amend the state constitution to add language that guarantees the right to collective bargaining. Over the course of thinking about the upcoming presidential election, my own campaign, and Prop 2, I have had occasion to think about how I came to my union consciousness. I wrote an essay on that topic for my campaign blog, and in the process of doing that, I realized that (1.) even most of the people to whom I am closest don’t know that story, although it is central to who I am today, and (2.) perhaps more important, it might be helpful in making a case in support of Prop 2. In the latter spirit, I thought I’d share it here, with a few revisions as appropriate for the different audiences. 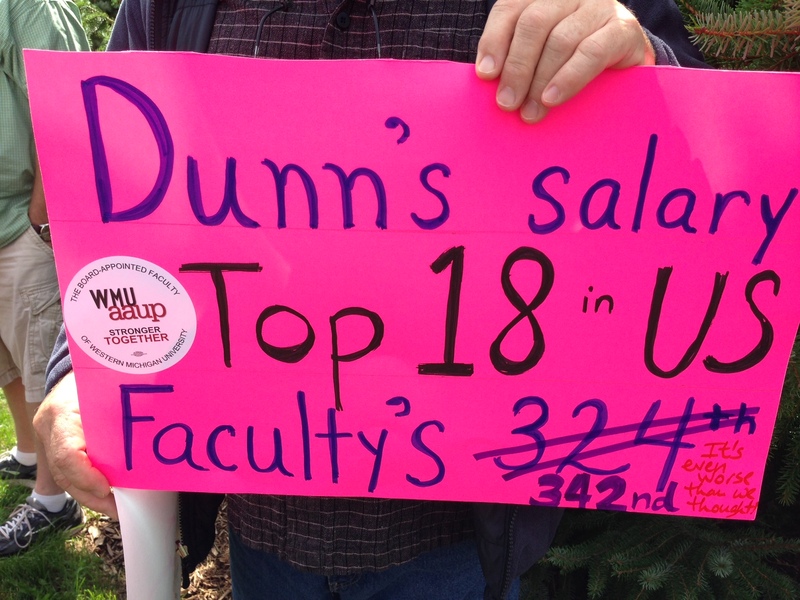 I am a professor at Western Michigan University (WMU), an institution that is a collective-bargaining chapter of the American Association of University Professors (AAUP). 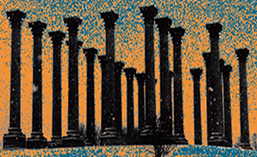 I have written previously (here and here) about the business of higher education and the financial prospects of faculty at non-elite colleges and universities, so if you are familiar with my earlier posts on that topic, you are already aware that anything that most people would consider “wealth” is pretty much out of the question for most of us here among the WMU faculty. However, we are very fortunate indeed to enjoy a solid middle-class existence and the possibility of continuing upward mobility over the course of our careers here. This good fortune is largely thanks to our union affiliation. However, with the recent shift in public sentiment in the U.S. toward public-sector workers and unions have come stagnating wages and serious questions as to whether it will be possible for workers in Michigan, including professors like me as well as everyone else who has to work for a living, to achieve or maintain a middle-class existence in the near future. This attitudinal shift was of course engineered by well-financed union-busting politicians and their corporate sponsors, and one result is that even in traditionally worker-friendly states like Michigan, so-called “right-to-work” laws are being taken up by state legislatures. In Michigan, both our state house and senate are Republican-controlled, and we have a Republican governor. “No existing or future law of the State or its political subdivisions shall abridge, impair or limit” the rights of public- and private-sector workers to bargain collectively. At a time when collective bargaining rights are far from secure, even in Michigan of all places, a state whose long stretch of prosperity through most of the 20th century is thanks largely to a strong union culture, Proposal 2 is a pre-emptive strike against passage of a right-to-work law in Michigan and against the nationwide GOP attack on unions, a product of that party’s desire for the permanent majority of Karl Rove’s dreams and of their apparent outrage at the idea that working people might actually be able to prosper in this country again someday and that upward mobility might once again be possible even for people weren’t born rich. When I joined the faculty at Western Michigan University in 2004, I was thrilled to have landed not only a tenure-track job that was about as close to a perfect fit for me as there could be but also that this job was at a strong union campus. The fellow who was chair of my department in those days, a local legend around these parts name of Arnie Johnston, handed me a copy of the 2002-05 WMU-AAUP Agreement as we got into his car to drive to the airport at the end of my campus visit. During the drive, Arnie offered me the position here and strongly encouraged me to read the Agreement carefully as I was considering my options. I had already been offered another position that I was considering seriously, and I had been up front with Arnie about that in our phone conversations preceding my visit. In the car that day, he emphasized the advantages of a union campus. But I did not need any convincing on that topic. That WMU is a bargaining-unit chapter of the AAUP was an extremely attractive feature of the job and a key factor in my ultimately accepting Arnie’s offer to come here. To this day, there is absolutely no question in my mind that I made the right decision by choosing WMU. There is also no question but that Arnie was 100% correct when he said that there is no comparison between working as a member of a collective-bargaining unit and working on a non-union campus. But of course Arnie was right about pretty much everything union-related: In his 42 years at WMU, he served on the contract negotiation team four times (three times as chief negotiator) and even served on the team that negotiated the very first WMU-AAUP Agreement. In other words, he knew what he was talking about. And what Arnie said to me on a snowy February day in 2004 as we drove to the airport is just as true today. As tough as things have gotten around here lately, those of us who have worked on non-union campuses or have friends and colleagues who don’t have bargaining units on their campuses know that the situation is far more dire at non-union institutions. Before I went back to school in 1998 to begin my doctoral work, having finished my master’s degree in 1991, I spent several years working as a research consultant for environmental and civil rights law firms, and I also taught college-level writing and literature part time, first in the Washington, D.C., area and later at several institutions in Georgia and North Carolina. I grew up in south Florida, where organized labor is far from the norm and which has had a “right-to-work” clause in the state constitution since 1944. My parents were not union members, and neither were the parents of most if not all of my friends. So the years between the completion of my master’s degree and my return to school to pursue a Ph.D. were thus critical to my developing union consciousness, especially the two years I spent in North Carolina (1996-98). During the years I spent working as an adjunct faculty member in North Carolina, a state whose hostility to public-sector collective bargaining is not only palpable in the daily experiences of many workers there but also codified in a 1959 law that directly prohibits public-sector employees from collective bargaining, I became so frustrated with the low pay, disrespectful treatment from employers, and poor working conditions for part-time faculty that I organized a movement to demand improved wages and working conditions on the two campuses where I taught, a community college and a branch of the state university system. I also published what I thought was going to be a one-time fact sheet for about 25 or 30 part-time colleagues, with information about things like how to get cheap dental cleanings (at the community college clinic) and basic medical care (at Planned Parenthood and a local Christian charitable organization that ran a clinic and whose help we qualified for because our income levels came in well below their threshold), but it quickly grew to a monthly newsletter with a circulation of over 600 part-time and full-time faculty at community colleges and universities throughout western North Carolina. By “exploited ridiculously,” I mean that the community college where I taught had no qualms about assigning adjunct instructors, or “part-timers,” to teach as many as five courses per academic quarter, meaning that we were “part-timers” in name only. And at a rate of pay of $976 per class per quarter, people who were trying to make a living by adjuncting (like me) had no choice but to accept all the assignments they were offered. One memorable quarter, I taught seven classes: five at the community college, with three different course preps, and two at the university (at $1620 per class). By “memorable” I mean that I was so buried the entire time that I actually remember almost nothing from that period of my life, during which I also waited tables at a local restaurant. My gross earnings that year (1997) were just over $17,000. One thing I do remember is that it was during that seven-course quarter that my grandpa died, and I returned to work after his funeral to an invoice in my campus mailbox at the community college. I was personally responsible for paying the substitute instructors who had met my classes while I was gone. Not surprisingly, my advocacy got me into some trouble with the administrations at both institutions where I taught, and especially at the community college. The occasion that stands out the most for me was when I published a chart of administrator salaries in my newsletter. Of course this was all public information, so I thought I was actually being tactful when I decided not actually to name the individuals in print. I just listed the administrative titles. I didn’t even identify the institutions; I just labeled the data charts “representative university in North Carolina” and “representative community college,” which I thought made sense because the newsletter went to six or seven other schools besides the two where I taught. A few days after that edition of the newsletter was published, I arrived at a campus-wide faculty meeting at the community college, having driven straight over after my shift serving lunch at the restaurant where I also worked, just in time to be harangued in front of the entire faculty by the college president, who took exception to my publication of his salary (and in the process outed himself as the “representative community college president” on my chart). I stood there trying to smile politely as a guy who was paid more than ten times what I earned working three jobs thundered at me from the stage. I still had on my waitress uniform. I don’t think the irony was lost on anyone there, except maybe the president. He did not seem aware of anything beyond his own righteous indignation. As difficult and demoralizing as those two years in North Carolina were, they were also highly instructive. My experience of having to work three jobs in return for near-poverty wages and no benefits, as well as the experience of researching for my newsletter and connecting with other activists at that time who generously shared their knowledge and experience with me, helped to cement my conviction that workers in all sectors have little to no hope for upward mobility without the ability to organize. We simply can’t count on our employers to do right by us out of the goodness of their hearts. Fast-forward to spring 2007, my third year at WMU, when I joined the WMU-AAUP Association Council as one of our three department representatives. From the beginning, I loved the work and the collegiality that came with being a member of the AC, and I found our meetings to be highly educational not only about labor issues but also about campus issues more generally. And after nearly six years of this work, I am running now for the position of chapter vice president because I still believe strongly that the best hope for protecting and improving the quality of life for faculty at WMU is a strong, robust, and active union. There have been some problems with the chapter leadership in recent years, with the unfortunate consequence that a lot of my colleagues are feeling alienated from their own union. I completely understand and actually share their frustration. It would definitely be easier to walk away, as so many of my colleagues have already done or have been tempted to do. But a situation in which the faculty feels frustrated by the way things have been going and feels alienated from its union isn’t good for any of us. We have to do something about that. The faculty is the union. Period. Every single bargaining-unit member has an enormous stake in the direction of the chapter and therefore has the right as well as compelling reasons to participate in determining that direction. I also believe that our best possible defense against the ill political winds that are blowing off-campus is a strong and united faculty on-campus. That means a faculty who is engaged, ready to get involved, and prepared to mobilize when the time comes. And that time is coming. Actually, it is already here. And those ill political winds aren’t just about a bunch of professors, and so neither is Prop 2. It’s about everyone who has to work for a living. That is why Prop 2 has been endorsed by hundreds of Michigan businesses, religious leaders, and lawmakers. So if you live in Michigan, please vote YES on Proposal 2 next Tuesday, and please do everything you can to impress upon your friends and family and everyone else you know who is registered to vote in Michigan to do the same. Michigan prospered when we had a strong union culture. The union workers who came before us built this state and led us to prosperity. We have no chance of getting that standard of living back and restoring a real possibility of upward mobility for working people in Michigan if we do not stand together. That is how unions work. That is why they work. We need to do everything we can to try to restore that culture and go from there. Passing Prop 2 is a good start, so please vote YES! Posted in "Right to Work", 2012 Election, Ballot Initiatives, Michigan, Professors: We're Rich and Lazy!, Proposal 2, Unions. College Presidents Selling Out to Gov. Rick Snyder? Professors: We're Rich and Lazy! Enter your email address to subscribe to alevei and receive notifications of new posts by email.